Includes: 12 x sturdy poles with steel spikes – easy install! 24m of our fencing is usually enough to keep your chooks out of your veggie garden, or off the back verandah, however if you need to cover a larger area you can double the length at a discount with our 48m Fence Kit. Keep your gardens safe and your girls happy with our our backyard poultry fencing. With 24m or 48m of netting, you can set it up in anyway shape or size you need to suit your yard! Keep your veggie patch poultry free, or fence the girls in to let them do their job and forage like crazy. We have designed our netting to be 1.5m in height to help deter your feathered friends from flying over the top. Our poultry netting is the perfect solution to adding free-ranging run space to your yard, without having to build a run. Flexible in size, its the perfect solution to free ranging happiness! Simply map out your area and setup in around 10 minutes. Changed your mind about the position? Easy! Move it about as frequently as you like! Disclaimer: This product is designed solely for the purpose of confining chickens. It is not intended to keep predators out, and is not strong enough to stop a determined dog, fox, or other animal. Popping in and out of the chook yard is a breeze with the Poultry Fencing easy access gate. 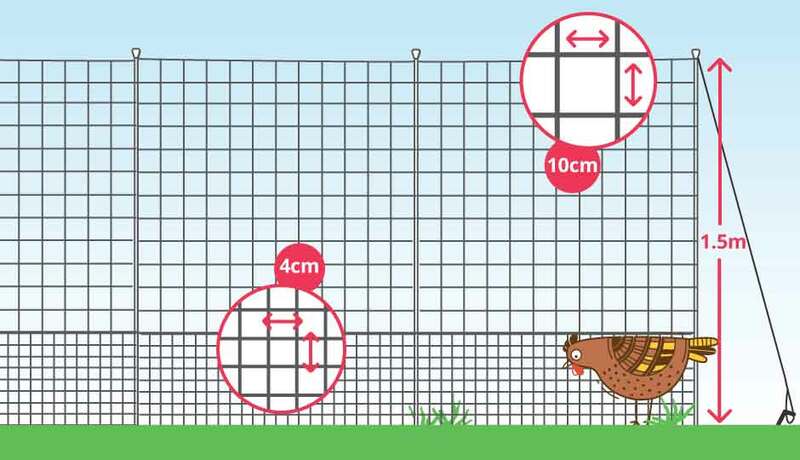 We have designed our netting to be 1.5m in height and with a small gauge mesh to help prevent your feathered friends straying. Strong, durable spikes make it easy to secure the fencing poles into the ground. Keep your fencing high and tight over uneven ground with the included guide ropes. Your chickens won’t be able to limbo under the fence thanks to our strong securing pegs. Setting up your Poultry Fencing is a breeze with our full colour assembly instructions included! Download your FREE brochure to learn more about our Poultry Fencing. Yes our poultry fencing does include a gate to allow you to access your feathered friends with ease! Will it keep predators out? We have designed our fencing with the purpose of allowing your chickens a free-ranging space, where you garden will be safe from their wandering eye and beak! It is not designed to protect them from determined predators. Will my chickens fly over the top? Our fencing is the tallest on the market, at 1.5 metres high, where most others are around 1 metre high, so your chickens should not have any chance of getting over the top. If they do, it may be time to clip their wings! There will be a gate post with clips that you attach and un-attach when you wish to come and go through the fencing. I don't need 24m, can I cut it or shorten it? While we don’t advise cutting the fence in any way, if you do wish to make it a smaller length, we suggest folding it back on itself, to create the size, space and shape you require.